All children deserve to have families who love, accept and keep them safe. Right now, there are dozens of children in the Cincinnati area who are wondering if they will ever have a permanent family. These are wonderful, loving kids that have so much to offer a family. They just need a chance. 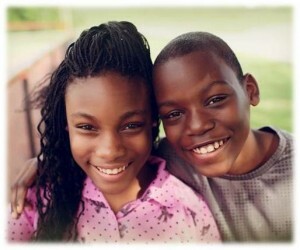 “I want a good family for me and my brother.” – India & Charles. Adoptive parents get to experience the joy of watching a child learn to read, teaching a child how to ride a bike, helping with homework, practicing driving, advising a teenager on picking a college. Kids get the security of knowing their family will be there for them forever because adoption is a lifelong commitment. Before a child can be adopted, biological parents’ rights must be terminated by a court. All parental rights are legally transferred to the new parents at the time of the adoption. This means adoptive parents have the same rights and responsibilities as parents whose children were born to them. All of our kids have experienced some level of abuse or neglect. They need your help to fulfill their potential and live happy, successful lives. There are several ways to adopt – internationally, through a private agency or through a public agency like Hamilton County Job & Family Services (HCJFS). The children available for adoption through HCJFS are currently in foster care, living in foster homes, group homes or treatment facilities. Families of all different kinds and sizes can adopt. Parents can be married, single, gay, straight, stay-at-home, wealthy or not. You can own your own home or rent – you just must have adequate space for a child and enough income to meet your basic needs. You must pass a background check and be in adequate physical and mental condition. Good adoptive parents are stable, dependable and flexible adults willing to advocate for their children and provide not just love, but commitment. You simply must want to provide a stable home and family for a child in need. Once you have decided that you want to adopt from foster care, you will have to decide if you want to adopt by first becoming a foster parent, or if you are interested in adopting directly. Adoption through foster care can be the best route for families looking to adopt a young child. Foster care might also be a good place to start for families who aren’t quite ready for the permanent commitment of adoption. Our greatest need is for adoptive families for kids 10 and older. If you decide you want to adopt a child who’s 10 or older, you will need to complete an application. We will help you identify and complete the classes necessary to prepare yourself for adopting a child. After you have taken the necessary classes, you will begin the home study process. This is an assessment of your home, lifestyle and your readiness to meet the needs of an adopted child. Home study requirements include providing medical and financial documentation as well as references and background checks. As part of the process, everyone in the home will need to participate in face-to-face interviews with the adoption assessor. This may be the longest part of the adoption process. Keep in mind that the agency is simply assessing if you are ready to adopt and if so, helping you determine what children you will be prepared to parent best. You can learn more about what to expect during the home study here. Once your home study is finished, we can provide you with more specific information about the individual children available for adoption. We’ll assign you an adoption caseworker who will present your family at a match meetings when there is a child for which your family may be a good match. Read about the Children waiting for adoption.